Jungle Red Writers: And Ginger Did It All Backwards! HANK PHILLIPPI RYAN: There are certain movies that are must-sees, right? If you're flipping through the channels and see, say, Gene Kelly here dancing with the umbrella and the lightpost--you gonna click? No, of course not. You'll slowly lower yourself to the couch, saying..oh, I'll just watch this one little part. Right? 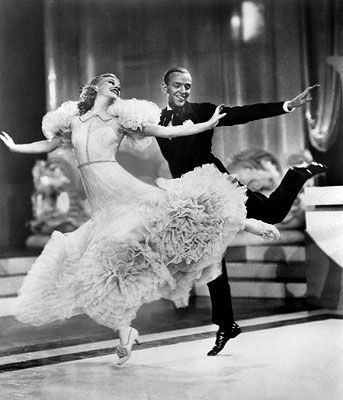 Or Fred and Ginger doing the Continental. Or Flying Down to Rio. You'd listen to Put the Blame on Mame. Louis Jourdan singing "She is Not Thinking of Me." Oh, how about Broadway Babies? Struttin' down the avenue, doing what they have to do, to be in a SHOW! And High Society? Forget it. I'm watching every second. Anyway. What does this all have to do with the hard-driving, thrill-seeking, need-for-speed (and quite hilarious) debut author Tammy Kaehler? I grew up watching classic movie musicals from the golden age of Hollywood. My obsession started with Shirley Temple and moved on to Singin’ in the Rain, The Band Wagon, Top Hat, Summer Stock, you name it. Everything with Fred Astaire, Ginger Rogers, Gene Kelly, Judy Garland, and other favorites. The movies were fun to sing and twitch my feet along with, but their worldview was often very traditional—doesn’t the plot description say it all? “Boy meets girl, boy loses girl, BOY wins girl.” With the benefit of age and time, I look back on them and wonder, what on Earth is the girl doing in all of that? Fortunately, I didn’t internalize that male-female dynamic. I grew up and spent a couple years extolling the values of a women’s college education (I worked in college admissions). Today, I write a mystery series with a female racecar driver protagonist—and if there’s ever a character in charge of her own destiny, particularly as she hurtles 2,500 lbs. of Corvette around a track at 150 m.p.h., it’s Kate Reilly. (ed. note: That's Tammy in the photo below!) Kate’s story would seem about as far removed from those classic films as it’s possible to get. And yet … not only do similarities exist, but watching those musicals just might have predisposed me to write what I do. First, there’s the element of beating the odds, with a side dish of suspension-of-disbelief. How do Judy Garland and Mickey Rooney save the orphanage in Babes in Arms? How do Judy and Gene Kelly save the farm in Summer Stock? They put on a show! How does every amateur sleuth in contemporary mystery fiction deal with finding a dead body and being incriminated in the murder? They solve the crimes while also being a success in their day jobs. 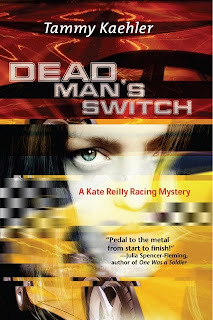 In Dead Man’s Switch, Kate Reilly gets a chance at her dream job, shows her potential when it counts, and figures out whodunit. All of these characters—literary or cinematic—have something special. Judy can dance and sing, and Kate can drive. But they also have a touch of the average, everyday person about them, which means we still find them relatable. Most importantly, what classic musicals and traditional mysteries share is the knowledge that everything will turn out all right in the end. I don’t mean every mystery ending is a happy one, but as SJ Rozan says in her excellent talk on genre, the basic arc of a crime novel is that the reader will get to the end and know what happened. There will be a reason for the tragedy or the crime—which is often better than we get in real life, where events and situations are often random and unexplainable. In mysteries, as in movie musicals, the good guys usually win and the bad guys are typically caught and punished. The farm is saved, the race is completed, if not always won—and sometimes, the girl even gets the boy. Obviously characters in mysteries aren’t toe-tapping their way into the sunset in every final scene, as on screen … more’s the pity? Much as I might like to attempt to stretch my point and argue that mysteries are as silly as movie musicals (some cozies are, perhaps), I won’t. I’ll simply admit to enjoying it immensely when the joy or despair in a character’s soul can only be expressed by a soft-shoe, a waltz, or a softly crooned ballad. I guess if Kate ever breaks into song in one of my novels, you’ll know why…. How about you all, Reds? Are you musical fans? What's your fave? One lucky commenter will win Tammy's DEAD MAN'S Switch! Before trying her hand at fiction, Tammy Kaehler established a career writing marketing materials, feature articles, executive speeches, and technical documentation. A fateful stint in corporate marketing introduced her to the racing world, which inspired the first Kate Reilly Racing Mystery. Tammy works as a technical writer in the Los Angeles area, where she lives with her husband and many cars. Ed note: ooh, lookit that cover blurb! Hot stuff! Oh, I just love musicals...Broadway, TV, local theater, school theater, all of them. I was only six when I saw my first musical at my sister's college - The Sound of Music - and I was hooked. Many moons ago, I had a roommate that hated musicals. She said no one walks down the street and just bursts into song. I do. Besides that, it's entertainment! Thanks, Gram, I hope you like it! And Nancy, I love, love, love that you break into song. I think we all need a touch of whimsy in our lives, don't you?! To Hank and the fabulous Jungle Red Women: thank you so much for having me here today on my favorite blog! My husband calls most musicals, and most of my favorite old music, "schmaltz". But a musical can lift my mood like no other, and I'm a big fan of soundtracks to keep the mood going. Tammy, as a child of the 50's it delights me to see women doing so many cool things, including driving race cars. Why shouldn't we get the same thrills as men, anyway? Best of luck with your new book. It's going on my Mount TBR wishlist, right now. Thanks, Karen! I'm with you on the mood-lift they can bring. I'm a big fan of what I call "cheesy pop" music, really cheeseball stuff like the soundtracks from Glee and anything I can sing along to. I restrain myself to head-bobbing while I'm at work, but in the car, watch out! My husband despairs of those choices too, but who cares. He likes to muck around with car engines for fun. I even love to see local theater--the heart and devotion that goes into the productions, you know? And high school musicals--forget it. I always cry, because the kids are so cute. My dream was to be Ruth in WOnderful Town. How about you? Any musical role you'd love to play? Tammy, are you visiting racing groups as part of your tour? Great post, Tammy & Hank! I'm a sucker for a good musical, too. When I was growing up in LA my parents took us to see all the plays that came to downtown to play at the Biltmore. South Pacific. Flower Drum Song. My Fair Lady. Annie Get Your Gun. What an amazing time it was for musical theater. When I went to college in NY I scraped together money for standing room seats for the Broadway show Funny Girl -- Barbra Streisand(!) before she was famous. She was so funny, and Rain on My Parade, oh my could she sing! Congratulations on the new book, Tammy. A female race car driver - the perfect fish out of water story! She's gotta keep coming out swinging. Hallie, I can't believe the stars and shows you got to see! What great memories. I've been luck enough to see Raul Julia in Man of La Mancha, Topol in Fiddler, and Glenn Close in Sunset Boulevard ... iconic performances, all. Thanks for the good wishes. Thanks, Ellis! It's funny what ultimately influences us, isn't it?! TAmmy, that's perfect! Very exciting. Let's see--I saw Robert Goulet and Julie Andrews in Camelot. I think Roddy MacDowell was Mordred...and could Richard Burton have been Arthur? Wouldn't I have rmember ed that? (Sigh. Sadly, no. I did see him with Elizabeth taylor in Private Lives.) It was in Chicago, in the..60's? Could that be? Grr. I wish I hadn't thrown out all those Playbills. My dad, by the way, was the music critic for the old Chicago Daily News, so he saw everything first! He remembers Kismet with Alfred Drake (can you imagine hearing This is My Beloved for the first itme??) and opening night of West Side Story (yes, he said, everyone knew it would be a huge hit) and so many more. And hilariously, he's classically trained, and doesn't like musicals! My father grew up with Gordon McRae in syracuse, so I think musicals are in my blood. My parents went to most of the biggies on Broadway and brought back the cast albums, so I know all the words. My mother also inaugurated me with the Mary Martin Peter Pan, so I was hooked early. Yes, Hank, I saw the Camelot that you did, and it was Richard Burton (and I saw the revival that he did on the road, in San Francisco). I also saw My Fair Lady with Rex Harrison and Julie Andrews. Those were the days! Why don't people burst spontaneously into song at intervals any more? My daughter and I watched The Gay Divorcee (was that the first Fred and Ginger one?). The plot was improbable, but the dancing (and the clothes!) made it worth watching. Tammy, kudoes for giving your protagonist a non-traditional occupation. I'll look forward to the book! And the randomly chosen winner is: DEE! (Gram) Dee, email me your address through my website--and we will get you the book! Remember, a commenter today will win Tammy's book! Now I'm incredibly jealous of all the fabulous shows Hank and Sheila got to see! And thanks, Sheila, I'm having lots of fun studying what real women in the racing world are doing and imagining Kate's world as similar. By the way, Sheila, I now have "There's a bright golden haze on the meadow ..." running through my head! My fantasy role--a fantasy because I don't look remotely like her or have the singing voice, not to mention I was an infant when the movie was made--the Marilyn Monroe role in Some Like it Hot. Her scene opposite Tony Curtis was va-va-voom, and he was always my secret movie crush. I'm a sucker for a musical. 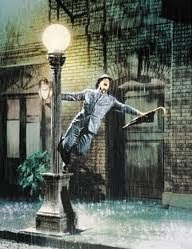 Love all the classics: Singing in the Rain, Wizard of Oz, My Fair Lady, Sound of Music, et al. Also loved Chicago, but really, REALLY loved the live shows of Jersey Boys and Wicked. Love your take on strong women! Wicked. Okay, I know it's newish, but that affected me so much, I cannot tell you. Evsn now, when I hear Defying Gavity, I start to cry. I can't help it, my all time favorite musical is Westside Story. I just love the battle of two groups and the street-wise guys who know more than social workers about why they're so bad. The love story doesn't end on a happy note which saves the audience from the disillusion of married boredom. But I think the audience is a little wiser at the end. My favorite of the contemporary (ish) musicals is Les Miserables. I saw that in London not long after it was out, many many years ago, and I was just stunned. Complicated, moving, great music, etc. It's still a masterpiece. Oh, too funny. I just posted the following under my Dear Hubby's Google account. Didn't realize he was signed in on my computer. I'm sure he'd have been quite surprised to find that he loved Gene Kelley! "I was in love with Gene Kelly as a kid. LOVE. Sorry to hear he was difficult on set but I suspect he was an obsessive perfectionist. Must have been to dance like that. Fred was lovely but there wasn't the same physicality to his dancing . . .
Tammy, can't wait to read your book! Car racing, horse racing--I'm hooked. Why is it that someone who almost always drives the speed limit has such a thing for reading about speed?" I'm not sure, Deb, but I love reading (and writing) about speed too, though I also drive the speed limit. Well, mostly. I do live in LA after all. Guys and Dolls is my favorite, followed closely by West Side Story. Darlene, now you've put "I've got the horse right here, the name is Paul Revere" in my head. What a fun thing, to have all of these great songs making me tap my way through the halls of my normally staid software company! So great to see you here, Tammy. Congratulations on your release! Great post on one of my favorite topics-old musicals. See me on my couch, singing along whenever TCM runs one. I still want gowns like Ginger's. And the dancing? So elegant, so much fun. Early exposure to ballroom led to my current Dancing With The Stars addiction. I like live theater but I lurve the old b&w's. Thanks, Rochelle! (And good luck with your upcoming release!) You know, it's interesting that I am not a Dancing With the Stars addict, as that does seem like a natural connection. Anyone else love DWTS? For me it was more about tap dancing than ballroom, in part because I tapped as a kid. I love hoofers! Oh, I was a hoofer too. Tap class in first grade and adult tap class with Jayne Meadows in the 90s. She was in her 70s and out danced all of us. I still have a very embarrassing photo of me, age 6, in my little pony tap dancing costume with my cousins. Yes, Karen, lots of schmaltz. But what they do for the spirit. I don't break into song, I dance down the street. I saw/heard Mary Martin in South Pacific and Carol Channing in Gentlemen Prefer Blonds. For an entire year, I worked at the headquarters of the International Ladies Garment Workers Union on Broadway, almost next door to West Side Story. Every day I looked at the marquis and wished. Too poor to buy a ticket. Racing on I-75 is far more fun than on a racetrack, with the added challenge of avoiding those pesky sirens. Skipper, I like your style! Tammy and Rochelle--do you know each other? AH, if not, you should...and my captcha word is chici. I rest my case. I think Rochelle and I met at Malice, and I think we're both in Los Angeles. Perhaps? That was it, Rochelle, the CCWC. I like your idea ... we can also develop the Sacramento Shim Sham. Any other hoofers out there?! I love musicals. I think life would be so much better if we all occasionally stopped and broke into song! Interesting association. Female race car driver sounds like a perfect heroine for a mystery series. Terell, I'm right there with you! Jacqueline, thanks, I think so too. :-) I can certainly get her into trouble in a wide variety of ways! And the winner of Tammy's book is: Jacqueline Seewald! JAcqueline, contact me via myu website, tell me your address, and Tammys book will be on the way! And oh, LCC dance troupe? I'm there! Let's think of a name..